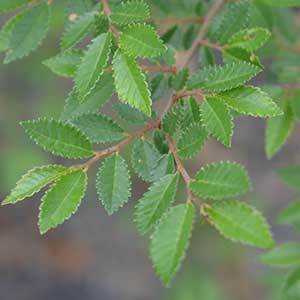 The Chinese Elm (Ulmus parvifolia) is one of the elm trees more resistant to elm leaf beetles. This is a deciduous to evergreen tree depending on climate with a moderate growth rate. Widely used as a street tree Ulmus parvifolia will reach around 12m and with a nice spreading canopy makes an excellent choice as a street tree. Foliage is dense and a deep green, flowers are inconspicuous and not regarded as a feature. Trees are sold as cutting grown and budded as well as from seed. The cutting grown trees do have a less vigorous root system. Look for specimens with one dominant leader for a good upright tree in the longer term. Reaching a height of up to 10m in cultivation although taller in ideal open situations, Chinese Elms grow well in full sun to part shade. A broad crown to 10m make this an excellent shade tree. As these are tree that are tolerant of a range of soil conditions including poorer soils, compacted situations in urban areas and both dry and moist situations they are valuable in urban situations. A few forms and grafted varieties exist including ‘Burnley Select’ which is more upright than the species and ‘Yarralumla Clone’ which is more of a spreading and weeping variety than the species. In a warm winter in Melbourne the Chinese elm will be almost evergreen, in a cool winter, semi deciduous. Further north they remain evergreen in all but the coldest years. Foliage turns a golden yellow in winter. Chinese elms can be pruned and will reshoot from old wood, in general pruning is not generally needed, they are however in the early stages often pruned to maintain a single central leader. Spread – Will spread form a canopy from 8 – 10 metres. Foliage – Deep green turning to red and yellow in autumn. Flowers – Green and inconspicuous.